In the course of the infomercial, Carey mentions all of the successful inventions that have made her money over the years. These include a hair accessory called Hairagmi and something called Dittie. Dittie is a line of tampons, and what is supposed to make Dittie so different is the wrappers for the tampons are colorful and contain “a fun, empowering Dittie message.” Wow, I’m sure men will now wish they had menstrual periods just so they could stick something fun and colorful inside themselves every month. The Dittie website expands upon this “fun” approach to tampons. The site includes an entire “Fun and Games” section. 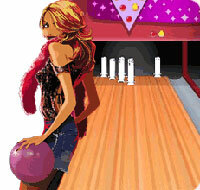 This features a video game called “Tampon Bowling”, which replaces the ten pins in a bowling alley with ten giant tampons (presumably Dittie brand).